I don't have enough pictures to cover all the days I've missed, but there is a goodly batch, and I'll try to get back to the one-a-day thing today. Promise! 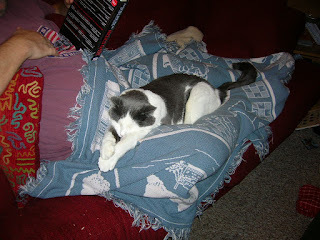 Well, Samwise has been our worry the last few days. Monday he was perfectly fine - exhibit A shows him sleeping on Mike's lap, thoroughly happy. Tuesday he started acting weird and Wed morning we were sure he was sick. It took him in and he had to spend 3 days in the hospital! 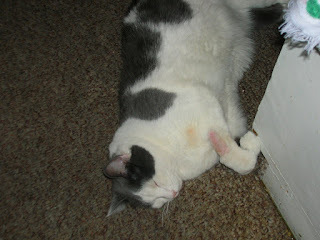 He had a urinary tract blockage, poor baby boy! You can see his front leg, where the IV was in. He seems better now, but he's still recovering. We're all very glad he's home. Mike's sweater is coming along well. This is the body. 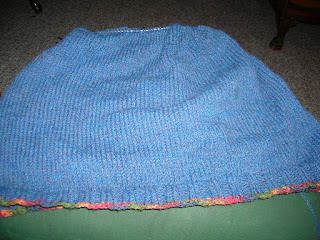 Now I'll knit up the sleeves and then I'll join them at the armpits and knit the rest! It's really cool, with lots of math to do along the way. There's a group of us all making sweaters with EPS (Elizabeth's Percentage System), explained pretty well here. 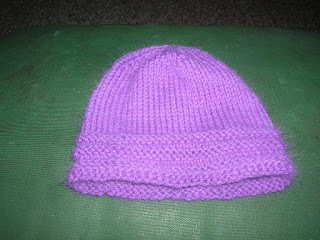 I cast on this hat at knit group Friday morning, and finished up by the TV in the evening. It's made of Lush Yarn, and it knit up in a jiffy. It's for a friend of mine who is going through Chemo - I just saw her at a meeting Thursday and didn't even know she was sick until then. This is very very soft, and I hope she likes it. I also just cast this baby on. I would like a fancy neck scarf like the one I made my mom. 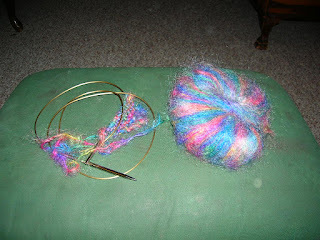 This is all mohair, though, and it's already bugging me a bit, but it should make a pretty little scarf, and it's still outrageously colored, so it's my style.